Jennifer Steinkamp's great uncle Ernest Hedinger was a seaman on the Dumaru during WWI, 1918. The ship carrying weapons and fuel was struck by lightning scarcely a couple hours outside of Guam. Powerful currents carried the helpless lifeboats out to sea. There were not enough provisions in the over crowded boat. Only 19 years old, Uncle Ernest died after 13 days. Out of desperation he had been drinking seawater, which caused him to imagine a nail stuck in his head. Soon after his death, two of the shipmates were cannibalized. The crew was trapped out at sea for 24 days total. 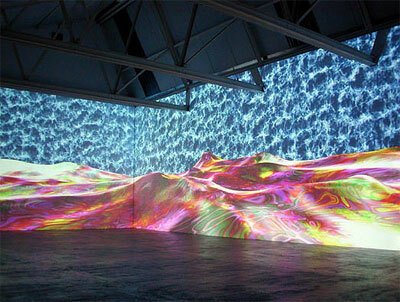 The installation consisted of 4 projections in sync to create a giant animated seascape panorama across 2 walls of the gallery. The imagery consisted of two ocean animations combined, one looking from a view high above the ocean, and the other from down in the water. My Grandfather was 19 when he went to sea on the Dumaru…Please reply….